When I was in high school I had a matchbook collection. My aunts and uncles would bring them back to me from hotels and I collected them wherever I could find them. 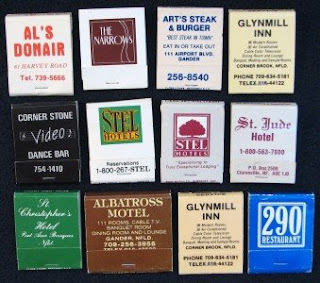 I found these matchbooks for sale on eBay, they are all from Newfoundland and I am sure I had some of them. Posted by Karen at 3:38 p.m.
A really nice, nostalgic site, I have linked to you, as all my toy soldier followers need a feminine perspective from time to time!! On the subject of book matches, I used to collect them as well (along with beer-mats. stamps and all manner of stuff, but they went the way of all flesh...I did keep one each of the matches though, in a big matchbox! I loved the colours!